The global high performance computing (HPC) market is expected to grow from USD 32.11 billion in 2017 to USD 44.98 billion by 2022, at a Compound Annual Growth Rate (CAGR) of 7.0% during the forecast period. Organizations in various verticals, such as manufacturing, energy and utilities, chemicals, government and defense, and education, need to resolve complex problems and calculations. HPC solutions can handle vast volumes of data with ease and can extensively support high performance data analysis. Moreover, these solutions can provide for faster processing of data with high accuracy. These benefits offered by HPC solutions have further propelled the adoption of these solutions across industry verticals. However, concerns related to data security may affect the adoption rate of these solutions. Organizations across various industries are facing a pressing need to deliver high-density, cost-effective, and robust servers in their data center infrastructures. Organizations require hardware that supports dynamic workloads from applications, such as Web 2.0 and cloud hosting. The HPC servers can deliver core count, increased frequency, rapid calculations, scalability, and power efficiency required for these high-end applications. Consumers in the government and defense application area have requirements pertaining to seamless delivery and faster response times while availing services related to the government initiatives. HPC solutions can help address a wide spectrum of defense-related requirements including real-time data acquisition and analysis, emergency operations preparation, disaster modeling and analysis, simulations, surveillance, and encryption/decryption of confidential information. North America is estimated to hold the largest market share in 2017, and the trend is likely to continue during the forecast period. Growing adoption of HPC solutions and services in SMEs and large enterprises is driving the HPC market growth in this region. Moreover, the increasing regulatory requirements have significantly driven the US HPC market. On the other hand, the HPC market in APAC is expected to witness an exponential growth and is projected to be one of the fastest growing regions in the global HPC market. This is mainly due to the large scale adoption of cloud-based HPC solutions in these regions. The market is segmented by components (solution and services). The solutions segment includes servers, storage, networking devices, and software. The services segment includes design and consulting; integration and deployment; and support, maintenance, and management. The deployment type segment includes on-premises and cloud. The organization size segment includes Small and Medium-sized Enterprises (SMEs) and Large enterprises. The server price band segment includes USD 250,000-500,000 and above, and USD 250,000-100,000 and below. The application areas segment includes government and defense, BFSI, education and research, manufacturing, media and entertainment, healthcare and life sciences, energy and utilities, earth sciences, and others (travel and hospitality, and retail). 1. 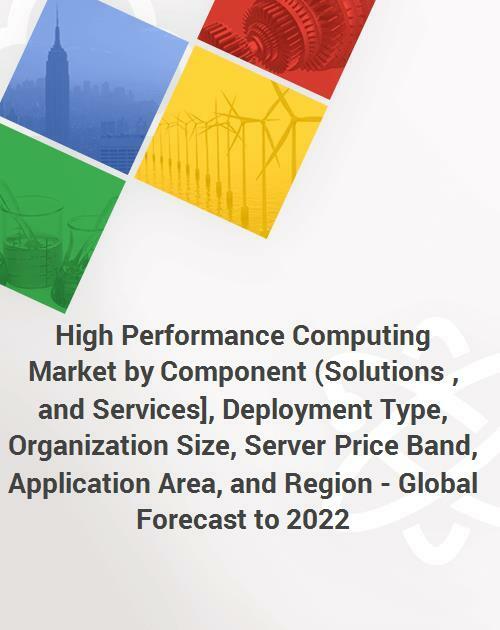 The report segments the HPC market comprehensively and provides the closest approximations of the revenue numbers for the overall market and subsegments across different industries and regions. 3. The report will help stakeholders better understand their competitors and gain more insights to enhance their position in the market. The competitive landscape section includes new product launches, partnerships, agreements and collaborations, mergers and acquisitions, and expansions related to the HPC market.